Math Mammoth Grade 2 Complete curriculum - description, samples, and purchase info. Math Mammoth Grade 2 Complete Curriculum gives you everything you need for 2nd grade math. It is available both as a download version and as printed copies. You can purchase Math Mammoth Grade 2 as a download, on a CD, or as already printed books. You can purchase printed copies at Lulu or Rainbow Resource. You can purchase a lesson plan for Math Mammoth Grade 2 to use it in Homeschool Planet online planner. Learn more. The chapter on coins (chapter 9) is included in seven currencies: US, Canadian, British, European, Australian, New Zealand, and South African money. You will automatically get all these versions when you buy the Grade 1 Complete Curriculum as a digital version (download or CD). Check out the table of contents for 2-A and 2-B (sample files) to see the topics covered in more detail. For $9.95, you can purchase a lesson plan for Math Mammoth Grade 2 in order to use it in Homeschool Planet online planner. Learn more. 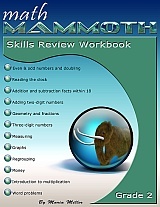 Math Mammoth Skills Review Workbook, Grade 3 provides additional practice for the topics in Math Mammoth Grade 2 curriculum. I recommend you only purchase it once you are sure the student does need supplemental practice. Learn more. An old-fashioned alarm clock or other analog clock where you can turn the minute hand and the hour hand will turn as it is supposed to (for 2-A). A ruler that measures in inches (for 2-B). A bathroom scales. It is best if you can have one that measures in pounds and in kilograms, or one with pounds and another with kilograms; however I realize most people wouldn't normally buy two bathroom scales, so if you decide not to get both kinds, it means you will just need to skip some activities in the measuring chapter (for 2-B). Base ten blocks to illustrate place value with hundreds (optional). The worktexts have pictures that are just like base ten blocks, and most kids can understand the concepts from the visual representation, without a physical manipulative; however for some kids the actual blocks can be beneficial (for 2-B). This is an awesome text! My kids are able to move through very smoothly. They have even gotten the confidence to work on the material (1st and 2nd grade) without my assistance. I have used another mastery type math program previously, but my kids became bored. Math Mammoth has kept their attention from day one, even when they have come across something they don't understand they have a motivation to keep trying. I have been so happy about this program that I purchased the Light Blue bundle CD from grade 1 to 7, and I have also made mention of it on Homemakingwithgrace.com on the post about the 2017-2018 curricula. I feel that this program is great for many learning styles, and is wonderful if you are trying to develop students that are self-motivated. After reading through and testing out the second grade Math Mammoth curriculum, I can say with confidence that it is clear she is a math teacher who understands math and how to teach it. Math Mammoth, on the other hand, provides lots of help and support for parents who can do math, but don't necessarily know how to teach the why behind it. 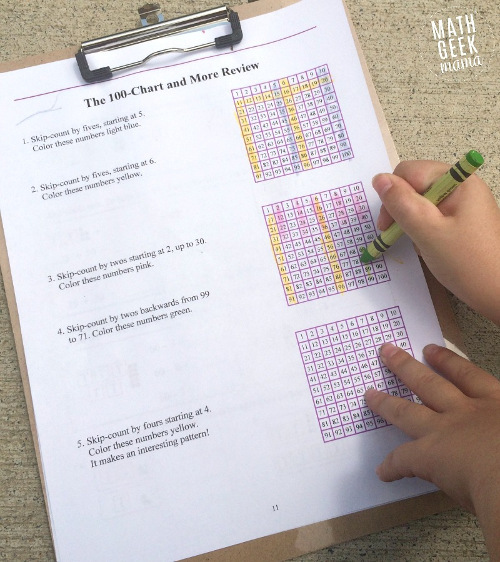 Read the full review at MathGeekMama blog. This year we decided to change our math curriculum due to poor recall when reviewing previous lessons. This semester we started using Math Mammoth for my 2nd grader and out of default tried the first grade lessons for my kindergartener. It is working great for both my sons. I've seen an improved interest in math as well as better independence. I am very pleased with the lessons. Instead of overwhelming my kids with manipulatives which caused too much distraction for them. I now just add them as they need them for further explanation and practice. I am so glad we found Math Mammoth. It is truly blessing our homeschool year. We are really enjoying this curriculum. We started Math Mammoth a couple of weeks ago so haven't done a lot yet. We have the whole program and are currently working on grade one and two. It is easy for both the kids and for their grownups to follow. The work texts are very simple to understand and explain how to do each type of problem. It's almost a self-taught program. There is a ton of other materials if your child needs more practice but we haven't needed any of it yet. The kids happily sit down and go through a few pages alone and ask questions every once in a while. We really like it and will continue to use it. We love the Math Mammoth books and I am very picky about our math curriculum. 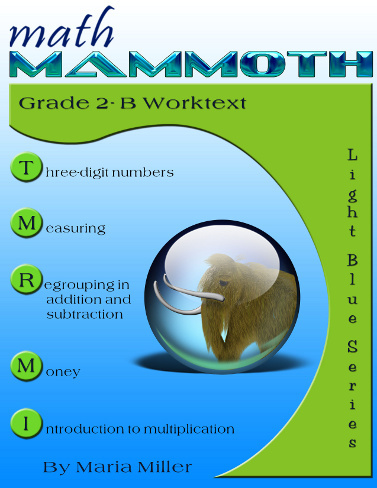 I prefer the Math Mammoth Light Blue program to any other program we have tried for instructor ease, student comprehension, strong emphasis on mental math and comprehensiveness...as well as the simple, uncluttered, presentation and interesting word problems. For the 2nd grade level an abacus (we use the Right Start Math abacus) and base ten blocks have been useful since we are "catching up." I work one-on-one with the children in this series at grades 2 & 3.
this is Max father of Leonardo a 7 years boy. We are Italian but for working reason we live in Vietnam. My son goes to an International school and he is in second grade. On last November we noticed that Leo was behind compare to the other students so we starting a more strong program. My wife and I personally have spent a lot of time with him doing together his homework. Our homework time is at least 1 or 1,5 hours a day. AT that time I was looking for some extra math exercise to do with him since the school is really lacking of additional material. Also his homework are very simple and easy. Don't mention the fact that during the holidays they don't give to the students any homework to do (this is opposite to the Italian system where they give you tons of homework to do and the parents get crazy with it!). Anyhow I was looking on internet for some math worksheet and after some researches I found your website. I was impressed with your work and clear exercises and the learning curve you have adopted was what I was looking. Now we use regularly your material to review and repeat and make more exercises. I'm very happy with the improvements our son has done over the past months! Thank you for you great job! Hi again! I just wanted to let you know that we did go ahead and get Math Mammoth 2A and 2B. We just decided to stop our old curriculum and work through 2A at a normal pace. We are going on week three and now if you ask my daughter what her favorite subject is, she says "math"!!!! It has been such a turn around and we don't dread doing our math lessons. Plus I absolutely love all the web sites that are suggested for practice. We have been using them for a break in routine. Thank you again, I am thankful for this program and think it is so wonderful that you actually answer your emails! I ordered Math Mammoth to compliment our current math program. I ordered the complete Math Mammoth 2 and my daughter LOVES it. It has taught her not just to memorize her facts but to understand how math works. On her own she figured out that 10X10=100. She said that it was 10 groups of 10 and by skip counting she figured out that it was 100. I enjoy using this program with her because it is so easy to teach, it's open and go. Thanks for creating such a simple yet very effective math curriculum! My boys are delighted with doing the grade 2 math addition strategies and are talking about them and practicing them with a new appreciation. It seems to me that my boys (an older one too) have all thought they can add small numbers easily, and so have ignored the strategies when they have been taught them. Later, they suffer for this... So going over them after a struggle with more advanced work is something they are now appreciating. One thing I appreciate about your math is that each problem has a double purpose, it seems, and so no opportunity is wasted. Somehow each problem also makes the child think, and I find that this is important, to keep them from doing math with a "Ho Hum" attitude. Once they develop this attitude, they seem to do the math in a trance and learn little. I feel, even at this very early stage, that I am seeing them embrace the challenge and learn something. There is evidence of them thinking mathematically for the first time... something I had almost lost hope for. I think that if other programs I have used have taught mental strategies, they have been in a way that a child can easily ignore the strategy. You are teaching the strategy with each set of problems, in such a way that they have to think strategy, rather than just see answers. You are very creative in this way, it is quite unique. By the way, still loving Math Mammoth. We're approaching the one year anniversary of using your curriculum. I pulled my daughter out of public school and she was unable to even answer 2+1 without getting perplexed, and with some mild dyslexia she was even getting confused with counting in certain instances where the numbers sounded similar (thirty vs. thirteen, for example). The emphasis on patterns and learning place value early, completing tens, etc, has advanced her by leaps and bounds. While she still asks for help, I am amazed at how she is able think through some of these relatively complex problems, and mentally add larger numbers - not without hesitation - but she can do it! Meanwhile my friends with children in public school are still doing single digit speed addition (memorization) only, but as far as I can tell speed proficiency is progressing just as well using MM with exposure to those "facts" in the context of more advanced problem solving. I enjoyed the worksheet so much that I went ahead and purchased the grade two downloadable light blue books. My son started math a bit later than his peers because it's not his strong subject. He was still adding on his fingers for nearly everything! After ONE lesson--just ONE lesson-- ("Some Review" lessons at the beginning of the 2A book) he has stopped counting on his fingers most of the time. He can answer me after thinking about it for a moment. He is looking forward to his math lesson each day, even though he's adjusting to the method and it takes longer than his other subjects. Thank you, thank you! I just had to email you and say how pleased I am with Math Mammoth! My oldest son is nearly finished with the Grade 2 and my second son just started the Grade 1. I like it more all the time, the longer I use it. Your explanations are clear and I love the way you teach. I like that there is no separate teacher's book; that everything is right in the text. I can see my older son really learning to think mathematically, especially when it comes to mental math, and even I am learning things by teaching it! My second son just turned six and Math Mammoth 1 is a perfect fit for him. He really was ready and needing to cement his addition and subtraction facts and that is exactly what he is focusing on with Math Mammoth 1. I just bought the complete Light Blue series download through Homeschool Buyer's Coop. Thank you for the great deal! And I was very pleased to open it all up and see that you included the Canadian money chapters for each level. We are in Canada and that is one reason I chose to use Math Mammoth in the first place. Makes my life easier! Thank you for an excellent program! We bought the Light Blue Grade 2 last week and we're LOVING it! I am using it to remediate my daughter, who is 10. She had such a mental block against understanding math, until your program! Just in one week she has light bulbs coming on left and right and is finally getting some confidence! THANK you! I'm considering switching my younger son over to Math Mammoth too! Now, my dear son is very bright in many ways, but at the start of the new school year, to my horror, he appeared to have forgotten the math that he had already learned!! Not just the facts, but EVERYTHING!! It was a nightmare to say the least. So the first thing I thought to do was to check out your website to see if you had any suggestions to solve a problem like this. And thank goodness, you did. You suggested to go back to the basics, so to speak. So with a weary homeschool mom's heart, I ordered your Math Mammoth 2nd Grade Workbooks. Although my son is doing 4th grade in other subjects, he is again doing 2nd grade math. But that is okay, because he is now learning how to properly do the mental math!!! I must not have done a good job with that during his foundational learning of math. But now, with your workbooks, he is!! I have always struggled with getting my sons to "see" how math works. But thanks to you, Maria, it has been easier. I like how your lessons are laid out, with problems to do in many different ways. Plus the word problems are great. They are different from other word problems in that they are a little more challenging than what we have grown to expect. Even I have trouble with some!! I would even like to see more word problems. But right now, we are happy with what we are using now. I certainly will order other books as the need comes. Thank you for your help, for the affordable workbooks, and all of the ways that you help us via your website. The cost was great and my son does less complaining because he understands! !